[By Nick, New for 2015] Happy Memorial Day Everyone! Dubba and I would like to honor all of those who gave their lives protecting our country. Without their sacrifices, who knows what our lives would be like today. Hopefully you don't use today to just cook out and drink but also take a moment to honor the friends and family who are no longer with us as well. To some of you living in the South East, this flavor isn't all that new but to everyone else in the country it is. Curse your Publix exclusives or whatever it was last year. 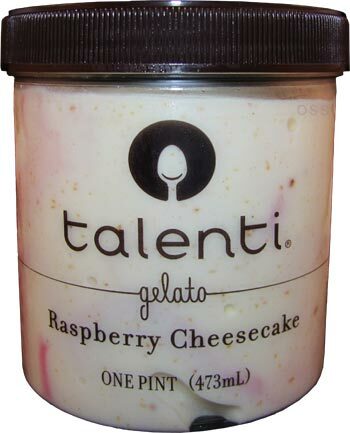 I have a love hate experience with cheesy flavors but I feel like Talenti can be one of the brands that land in the love side. 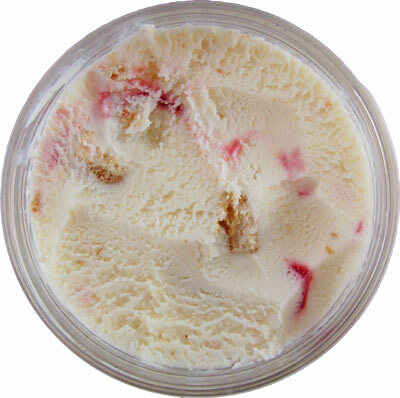 Scooping down reveals plenty of cheesecake chunks and that pretty raspberry swirl. Digging in, the cheesecake base is nice and mild. Nothing heavy or overly cheesy. It's pretty tame to be honest and I like it a lot. Especially with all these graham cracker chunks making it taste just like an actual cheesecake from the start. 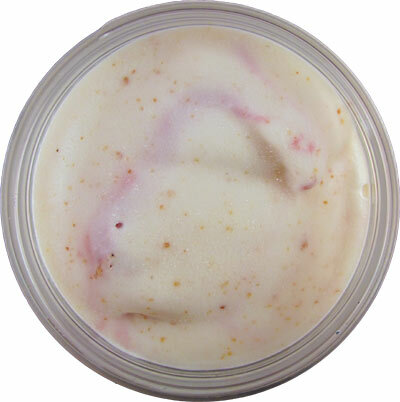 The raspberry swirl is sweet as described. It's not woodsy like their black raspberry flavor or all that tart either. It's just a sweet swirl of raspberry goodness. The star here are the cheesecake chunks. Not only are the prevalent, there's something special to them... they taste like they've been hit by a touch of lemon! Honestly, I was not prepared for this and felt like I was going crazy when I bit into one and tasted it. There's no mention of lemon anywhere but each cheesecake chunk has that undeniable citrus kick to it. It's honestly the perfect compliment to the rest of this flavor and brings everything together. What's missing is some tartness and the lemon adds it. Sure there's still some cheesiness to the chunks but it's on par with the base. When you get all three components on your spoon, this becomes one of the best fruity flavors I have ever had. While not topping Hazelnut Chocolate Chip for my favorite new Talenti flavor, it sure is giving Salted Peanut Caramel a run for the second spot. Great job on this one Talenti! Why it called "Raspberry Vinaigrette" since it should be raspberry sauce. This is one flavor my local Giant has yet to receive. I can't complain since they pretty much had every other flavor within a few days of you guys posting the new flavor list. My favorite flavors so far are their seasonal Egg Nog with French Toast Crunch cereal, Salted Caramel Peanut, & Caramel Apple Pie. Alek, because there's balsamic vinegar in the sauce. It says raspberry sauce in the ingredients but I'm guessing vinaigrette makes it sound better. Either way, you don't notice the balsamic. Anon, yeah I've only seen it at Shop Rite around me. No other stores have stocked it yet. number/letters, I'm calling you John Doe from now on ahaha. And the tartness is more like an acidic bite and not pucker worthy. This one really looks good; hope my grocery store gets it soon! It does list lemon oil on the ingredient list so that may be what you're tasting. Good review and a hope both you and Dubba had a good Memorial Day! Anon, I must have missed it in the slew of all those ingredients. Hope you had a great Memorial Day as well! Danielle, apparently there's lemon oil somewhere in the base according to the ingredients. Open ID, that's your new name then;] Don't worry, it's nothing like raspberries & cream. While I liked that flavor, this is a different one completely. So glad one of you guys finally tracked this one down. The details of your review are spot on and I loved it just as much as you did. I'm 3 pints deep into this particular flavor now. The chunks are just out of this world. And this flavor made me ponder something. I think it's time Talenti attempts a crack at a Pineapple flavor of some sort. And no, I don't mean a Sorbet. John, thanks for agreeing with me aha. It's always nice when someone validates my reviews. As for pineapple, pina colada would be the safe bet for a summer limited edition since they already do fall and winter. I'd want to see a major company take a crack at pineapple upside down cake though. 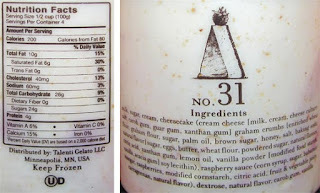 That long ingredient list is exactly why I dont buy Talenti anymore. Ive been moving to mostly organic products anyway, but I certainly won't buy something with 100 ingredients, most of which aren't needed. If anything I hope Talenti does a take on Jeni's Brown Butter Almond Brittle or something similar to that flavor since Jeni's is way too expensive to buy repeatedly. Yeah, that'd be a bold move if attempted by one of the heavyweights, Nick. And let's not forget about the Haagen Dazs Pineapple Coconut, which is still going strong. Definitely in my personal top-10, in fact. And lastly, that ingredient list in that front porch pint is scary looking as hell. Looks like a mini-novel. Surprised you didn't have to turn a page to see the list in its entirety. D, this is the only flavor with such a long list. Most other flavors are much more reasonable wen it coes to amount of ingredients. Anon, I don't see that being likely at all. If anything, a company like Steve's would try to imitate it. John, I would love to see Talenti do it because I'm sure they'd do it justice. HD's pineapple coconut is definitely a nice, summer time flavor. @Nick: dont be cranky, I just got curious if ANYONE had done it since pineapple is such a rare flavor. Dubba, your crankiness is rubbing off on me. Giant has a pretty good Pineapple Coconut flavor in a pint. Got the tiramisu at a Harris Teeter (southeast chain, now owned by Kroger). Man oh man! It is faboo! Very disappointed. Little cheesecake and little raspberry. Ice cream watery. I would never bother trying any other flavor. Compared to Breyers raspberry cheesecake (10) on a scale of 1-10. Your product not even (1). Very, very disappointed.